This odd little booklet came from the “Misc. Fashion” files. One of those items that is somewhat difficult to actually pin a label on. At first glance one would suppose it would be chock full of all sorts of hints and information about clothing yourself or your family on a budget. 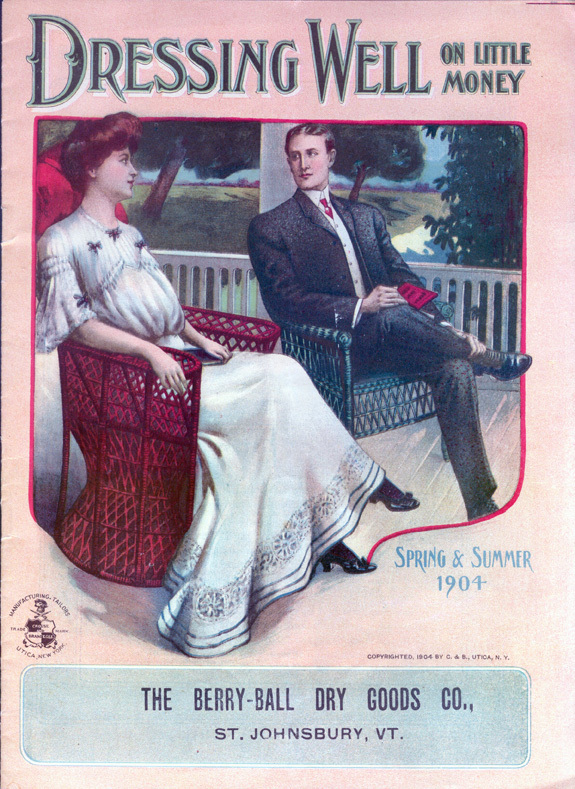 Despite the title, it appears to be an advertising give-away, most likely from a tailoring shop, as on the second page we find: The magazine is eight pages in length, with black and white illustrations through out – except for the color front and back covers. The box on the front cover is imprinted with the Berry-Ball Dry Goods Co. Which indicates that this was a magazine that was ordered from a central clearing house, where it was imprinted with the purchaser’s company name. 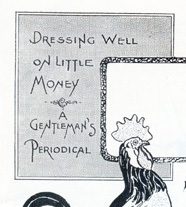 However, despite the title – there is very little about Dressing Well For Little Money. A few of the written pieces exhort men to consider purchasing their suits of “good taste and quality” ready-made. And there is very sound advice regarding the “Whole Cloth Back Suit” – wherein the back of the jacket is made in a single piece, in order to avoid ” . . the breaking of the stripe or check”. A man demands that a woman shall always be well dressed. He is a perpetual victim to the click of high-heeled shoes and the frou-frou of silk skirts, and to his private code, considers mother hubbards and curl papers as suffcient grounds for divorce. But – he expects his wife to achieve the miracle of first-class clothes on an eighth-class income. EVERY man demands that a woman’s heart shall be an ice-bound fortress, diffusing a cold storage atmosphere that will give every other man who approaches her frosted feet. But – he wants her to turn into a seething volcano of red-hot affection when he draws upon the scene. All in all – it’s an odd little bit of printing. If you’d like to take a look at the magazine in it’s entirety – you can download it in full (for a small fee) – by going to this link: DRESSING WELL DOWNLOAD.